Yan was an unlikely choice for lunch with a friend of mine. Unlikely, only because when faced with the question of where to have lunch, my brain just doesn’t gear itself to picking a Cantonese restaurant. It just starts whirring around on where to find a good set lunch – and most of the time, it will be Western. 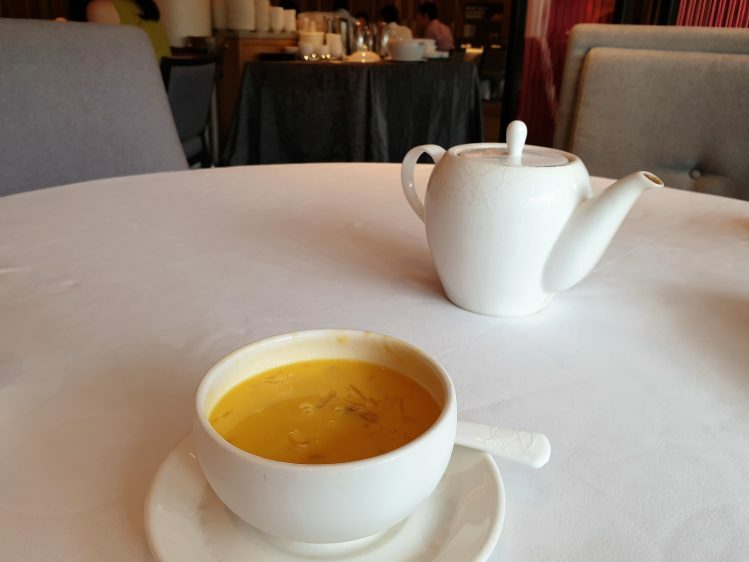 But I was itching for a change, and when I saw that Yan had a $38, 5-course set lunch menu, I suggested it to my friend who was, needless to say, surprised that we weren’t heading for one of the new European restaurants in town. In any case, the National Gallery is a wonderful place to have lunch. Not only can you make a pre or post lunch visit to view the largest collection of modern art in South-east Asia, you can also take one of the many free tours that are held daily and dive a little deeper into artworks or the history of the building. I was lucky to catch one that focused on the architecture of the beautiful gallery. But enough about that. On to the food. 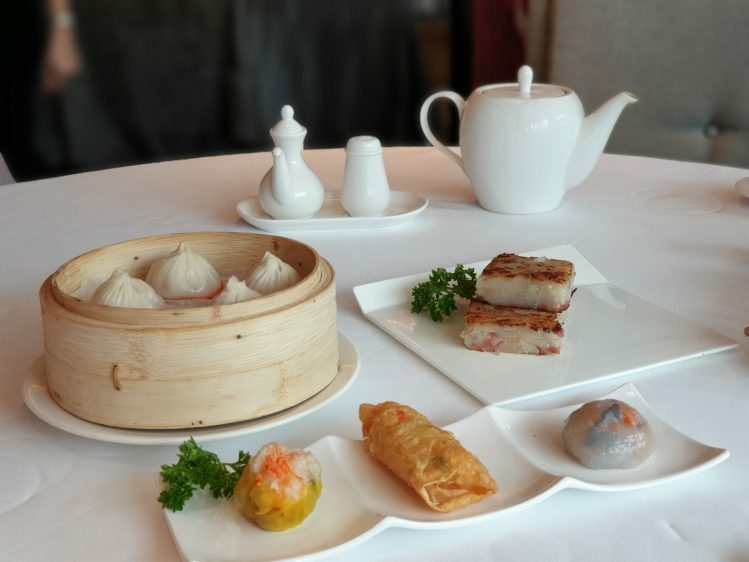 Yan’s 5-course set lunch comprised dim sum, soup, noodles, fish and dessert. I have a feeling that would have been enough for us, but greedy us ordered xiao long bao and radish cake as extras. And sure enough, it made us so full that we could barely finish our noodles. 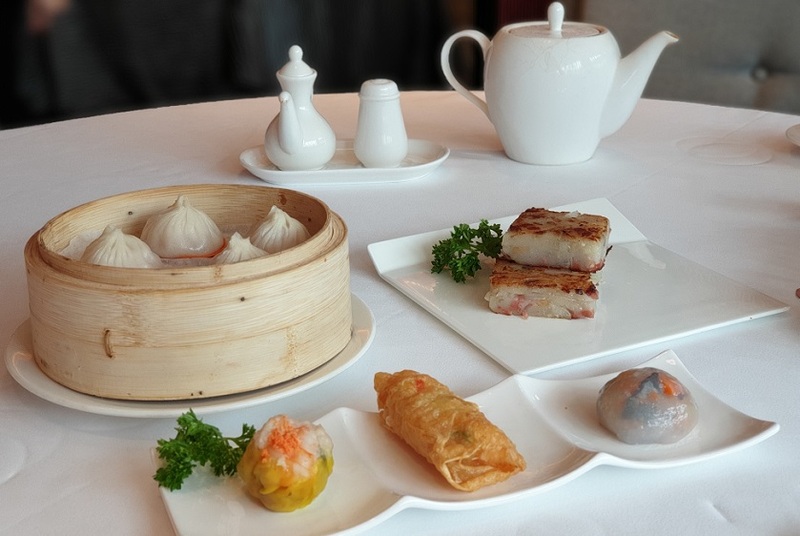 So the Dim Sum Trio you see upfront is part of the set. The prawns that were used were lovely and chunky, not measly at all. The skin on the crystal dumpling was too thick though, likewise on the xiao long bao. Radish cake was just right though, it even had lovely crisp edges. 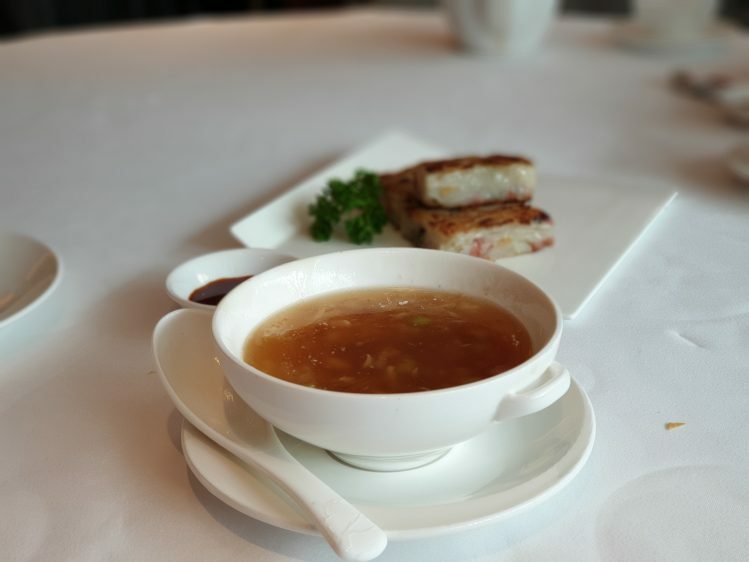 When I found out that the soup was Fish Maw, I was a little apprehensive based on my occasional encounter with gluggy fish maw soup. But this was just the right consistency, not too thick and tasted good. Sea Perch Fillet. 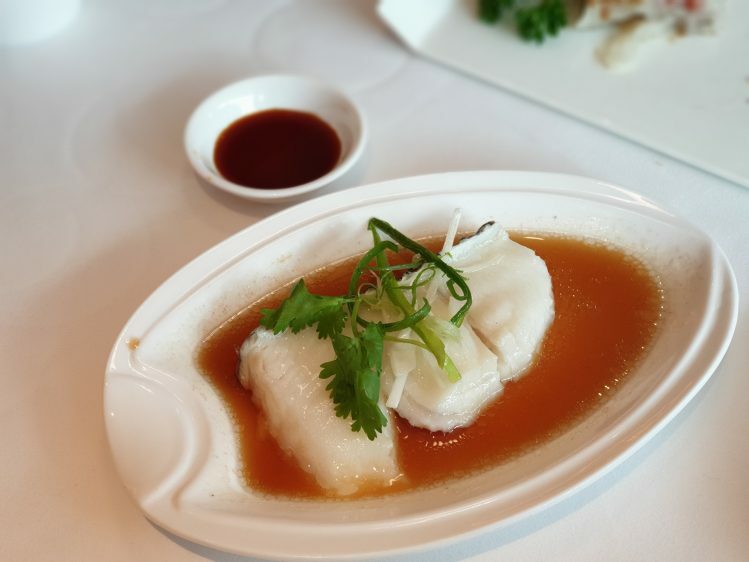 Delicately steamed fish in a light soya sauce is always one of my favourites at a Cantonese restaurant. By this time, we were feeling it. 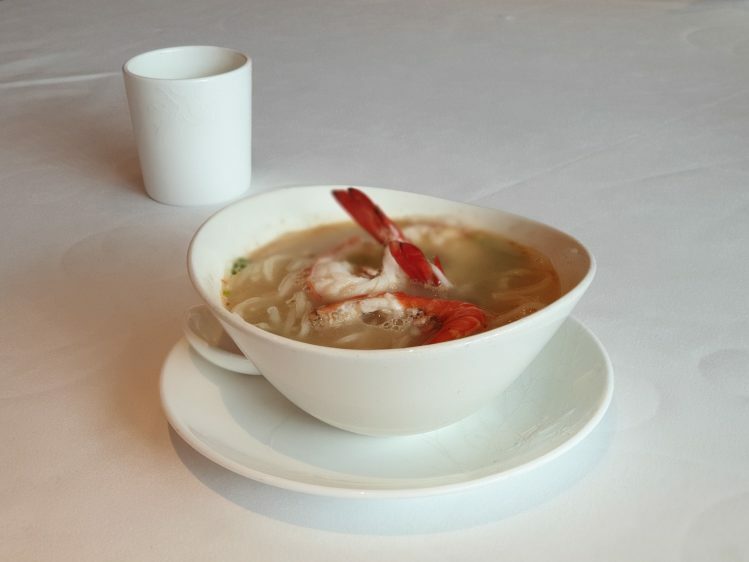 I barely ate these Poached Japanese noodles but I will say the prawns were big and fresh. You can tell by looking at the intensity of the colour that the broth was rich, too. Well, after all that, I suppose this light dessert of Chilled Mango Cream was the perfect end. Next time, I really want to try the Peking duck at Yan. Judging by the what I had so far and other reviews, sounds like it would be a cracker!